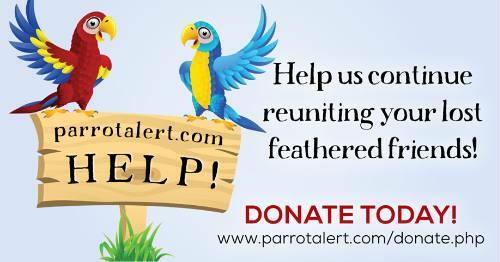 ParrotAlert.com is a FREE international geographical Lost, Stolen and Found Bird / Parrot reporting and alerting site. ParrotAlert utilises mapping technology to help you report the precise report location of a Lost, Found or Stolen Parrot / Bird and enables our system to check and alert on possible matches. When you submit a report via ParrotAlert.com, ParrotAlert automatically generates a high visibility PDF flyer/poster of your report and automatically cross posts the report to social media platforms, thus eliminating the need to spend time on-line when you could be distributing flyers, searching and networking off-line. Even if you search our database and a matching report isn't available, we recommend submitting a report, and we'll send an alert when a possible match appears in our database.